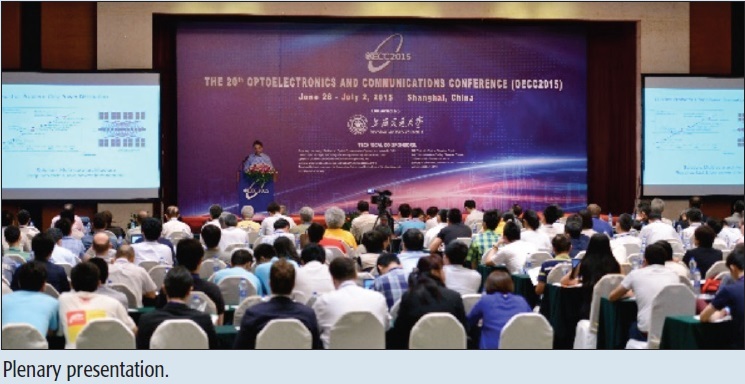 The OptoElectronics and Communications Conference (OECC) is one of the biggest worldwide conferences focused on the latest optical and photonic research areas. OECC 2015 was held in the Shanghai Everbright Convention Center, Shanghai, China, from June 28 to July 2, 2015. The conference provided a platform for researchers from around the world to share their latest research advances, promoting international collaboration. The conference was sponsored by the IEICE Communications Society, the IEEE Photonics Society, the IEEE Photonics Society Shanghai Chapter, the IEEE Communications Society Shanghai Chapter, the China Institute of Communications, and the Optical Society of Korea. There were 470 submissions in total, including 327 contributed submissions from 33 countries or regions around the world. A total of 205 papers were accepted, for an acceptance ratio of 62.7 percent. Each paper was reviewed by at least three peer reviewers. There were 152 oral presentations, 124 invited presentations, and 53 poster presentations, arranged into eight categories, two symposia, and two workshops, listed below. Two workshops were organized in the afternoon of June 28. The opening ceremony was organized in the morning of June 29, followed by three plenary presentations. The first plenary presentation was given by Prof. B. Jalali from UCLA on the topic of ‘Optical Information Capacity of Silicon’. The second plenary presentation was given by Dr. Atsushi Takahara from NTT Network Innovation Laboratories on the topic ‘Next Challenges with Virtualization of Network Infrastructure’. The third plenary presentation was given by Prof. Chao-Yang Lu from the University of Science and Technology of China on the topic ‘Recent Experimental Progress in Quantum Information Processing with Photons and Cold Atoms’. In the technical sessions, there were 64 parallel oral sessions and one poster session during the conference period. Among 64 oral sessions, there were 10 symposia sessions covering the topics of optical wireless communications, stimulated Brillouin scattering, photonics electronics devices and nanophotonics. The post deadline paper (PDP) presentations were organized on the evening on June 30. Four post deadline papers were accepted after the revision of technical committee members. They were “Record Field Demonstration of C-band Multi-Terabit 16QAM, 32QAM and 64QAM over 762km of SSMF” by Rahman, Coriant R&D GmbH, Germany, “What is the True Value of Dynamic Optical Path Switching?” by Kurosu, NIAIST, Japan, “First Demonstration of Holistically-Organized Metro-Embedded Cloud Platform with All-Optical Interconnections for Virtual” by Chen, BUPT, China, and “4–28 Gbaud PAM4 Integrated ROSA with High-Sensitivity APD Datacenter Provisioning” by Nakanishi, NTT Corporation, Japan. The banquet took place on the evening of July 1. During the banquet, best student papers were awarded to three students. A review of the past 20 OECC conferences by sand painting was made successfully. Chinese traditional Sichuan face-changing was also performed. OECC 2015 was concluded with great success. A total of 470 submissions were obtained for the TPC to review. Among those submissions, the three largest submission totals by country/region were from mainland China, Japan, and the United States. Finally, 403 participants, including 206 non-Chinese nationality participants (~51%), participated in the conference this year. Three plenary talks, 124 invited presentations, 152 oral presentations, and 53 poster presentations were arranged. Four PDP presentations were selected; however, this year there were six no-show presentations, including two poster presentations. OECC/PS 2016, to be held in Toki Messe, Japan, was promoted to all participants on July 1, 2015, a fantastic banquet night in Shanghai!